Thanks for your awesome site!! Wowzer trousers! Another giveaway! Your so generous this holiday season! Merry Soon to be Christmas! These gift cards are so cute, wish they had them in store!! oh and I like you facebook too! I love Totatally Target. Thanks for all you do. Totally Target Rocks!!!! Awesome gift card too!!! And of course actually love it! Thanks so much for the opportunity – would love to win a target gift card!! you’re the best! thanks for another great opportunity to win a gift card. 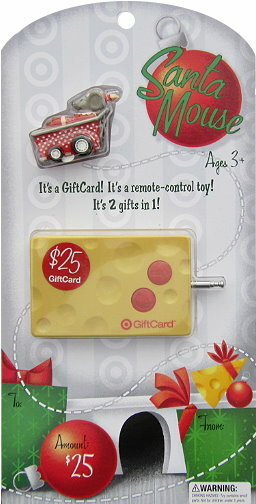 I would love the Remote Contol Santa Mouse gift card too! This is another awesome giveaway!! Hope to win! Love the givaways! Thanks! first timer, and am already loving it! i would love a gift card!!! Mmmmm….. been a fan of Target for years, Now a fan of TOTALLY TARGET!!! YAY.. TOTALLY TARGET!